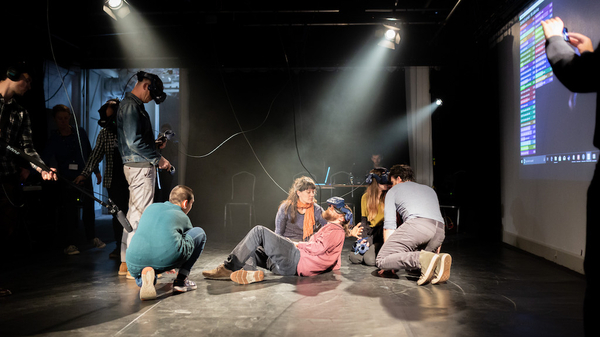 In this Lunchtime Talk Studio Resident Lisa May Thomas joins us to discuss The Figuring Project, which brings together artistic, scientific, and technological expertise and practices and asks, what happens to our bodies in a simulated virtual world? Dance artist and researcher Lisa May Thomas, project artistic lead, will be talking about how this project came to be, the creative processes involved across many different disciplines, and about the prototype participatory installation event which happened at the University of Bristol this September. The Figuring project brings together an experienced team of dancers, designers, digital technicians, and computational scientists, enabling an exchange of skills and knowledge between scientific and artistic practices. Molecular physicist and Computer Scientist Dr. David Glowacki, is the scientific and technological lead for the project. Alongside Lisa, Mark Wonnacott, who designed the visual virtual aesthetic for Figuring with David Glowacki, Mike O’Connor and Lisa May Thomas, plus Emma Hughes, who was the project producer will both also be present and will talk a little about their roles in the project.